Artichokes are hearty vegetable that have a thorny exterior with spiky outer leaves that protect the tender inner heart. The nutritional and antioxidant properties they have are great natural aids in preventing heart disease, cancer and birth defects. Artichoke hearts have some of the highest level of antioxidants amongst all vegetables. The antioxidant level of artichokes have been reported to improve heart health, as well as protect against the oxidation of cholesterol which aids in warding off arteriosclerosis. The leaves of the artichoke contain cynarin and silymarin which supports healthy liver function. These rich phytonutrients boost regeneration of liver cells while decreasing blood cholesterol levels by speeding up its excretion. Artichokes are helpful in aiding digestion, as well as helping control blood sugar levels. These nutrient rich vegetables have natural diuretic properties which are rich in insoluble fiber, helping regulate the digestive tract, as well as alleviating the symptoms of IBS (irritable bowel syndrome). 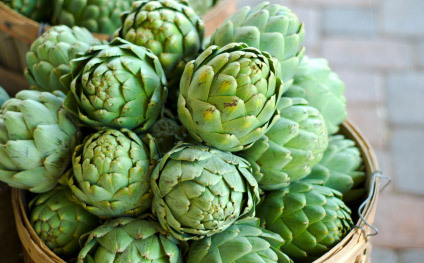 The fiber level is high in artichokes while low in calories making artichokes a healthy option. Artichokes are great for overall health in that they have a balance of nutrients, rich in potassium and folic acid. The high vitamin C content in artichokes adds to their cancer-fighting potential. Artichokes are most commonly eaten dipped into a dipping sauce, stuffed, used in other dishes, or simply eaten steamed by themselves. If you aren’t getting your artichokes in be sure to pick some up as they have so many health benefits and amazingly dense in antioxidants. Next Post Pomegranate – Delicious Jeweled Gems! Great blog you have here friend. I would like to reiterate the benefit of knowing this information and what works. I hope everyone reading this blog takes advantage of all the great information. It is very useful information, and can be a lifesaver to so many in need of wellness and health.